How to Celebrate ‘World Vegetarian Day’? I’ll be honest. I was a bit flummoxed when I first read that October 1 is celebrated as World Vegetarian Day! As someone born in India, vegetarian food has been a part-and-parcel of life as far as memory stretches. My family loves its fish, meat, seafood and what not. But we love our vegetarian food as much. So much so that you’ll see the lot of us sticking to vegetarian food during the relentless summers – easy on the digestive system – and on some festival days – for spiritual reasons. Vegetarianism is a norm and a way of life in several parts of the world. Curious, I went on an internet searching spree – starting with the Oxford Dictionary – and found some rather interesting trivia about World Vegetarian Day. The Oxford Dictionary defines ‘vegetarian’ (noun) as “A person who does not eat meat or fish, and sometimes other animal products, especially for moral, religious, or health reasons”. The day has been Observed worldwide (says Wikipedia) since 1977. It was established by the American Vegetarian Society to create awareness about (in a crux) the benefits of a vegetarian lifestyle in a predominantly meat-eating society. October is Vegetarian Awareness Month. It comes before United Nations World Food Day observed on October 16 annually. There is no doubt that I will be celebrating World Vegetarian Day – a daily meal in my household is incomplete without a sabji (cooked vegetable dish). 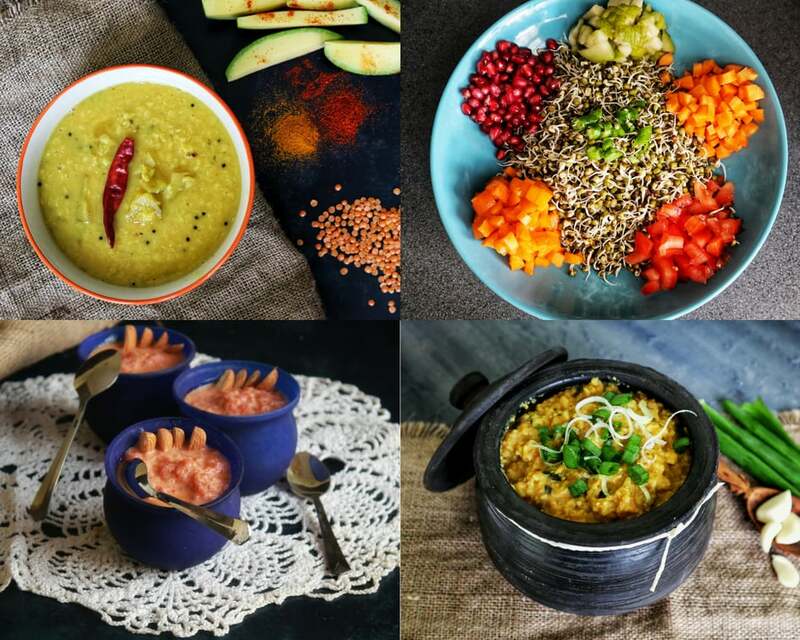 But if you are a newbie or are simply looking for ideas to dedicate October 1 to kick-starting a vegetarian lifestyle, here are a few suggestions. Lentils are a good substitute for those looking at vegetarian options. Start off your day with power-packed Savoury Mixed Lentil Crepes, move on to a mid-morning snack of Sprouted Mung Beans Salad Bowl and let lunch be an Elephant Foot Yam Curry or Potatoes in Creamy Poppy Seed Paste with bread of your choice (or rice if you prefer that!). Feeling peckish in the evening? Have a few Vegetables Chops. And if you’re still feeling hungry, let dinner be a light affair of Spring Onion & Garlic Khichdi. End the day on a sweet note with the Gaajar ka Kheer. And as and when you make any of these, don’t forget to tag From The Corner Table on Facebook/Instagram/Pinterest.